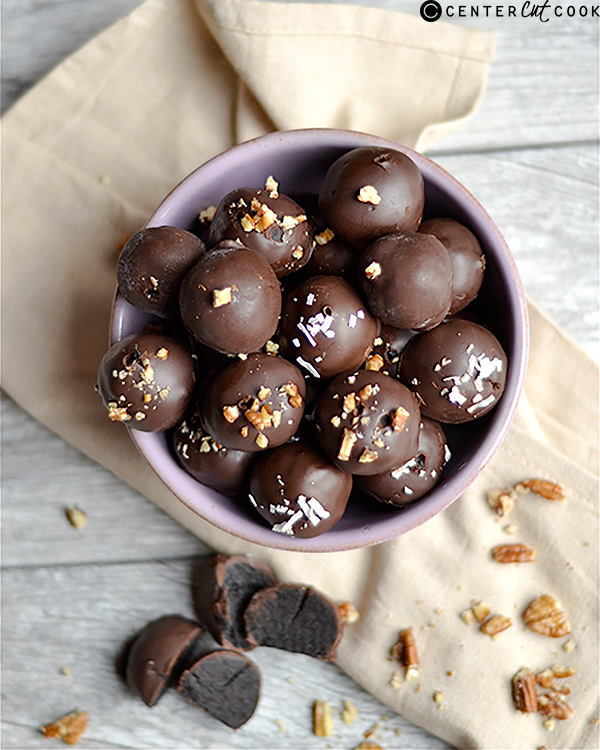 These No Bake Chocolate Cake Batter Truffles have all the taste of the most indulgent and delicious chocolate cake in a bite sized truffle!! So simple and delicious! My favorite dessert without hesitation is chocolate cake. I can’t think of anything better. I love it so much that I have to limit myself to my favorite chocolate cake only once a year for my birthday (oh and the leftovers that follow for a few days). But I’m excited. Because I just came up with the perfect way to enjoy my chocolate cake in one bite!! The ultimate fudge-y moist dark chocolate cake batter wrapped up in a chocolate shell. I mean, it has just made my life. What I love about these is that I don’t have to go through the drill of baking a chocolate cake and assembling the whole thing together. Or also whipping together a delicious frosting. These are so much easier! I put together 7 simple ingredients (that you probably have in your pantry right now) to make a thick batter. Once they are formed into balls, melt your chocolate chips or chunks and coat your cake batter balls. Sprinkle with any of your favorite toppings: colorful sprinkles, chopped nuts, coconut flakes, or even shaved chocolate. Let them dry to harden, or you can also freeze or refrigerate if you can’t possibly wait any longer. I *might* have done that. A few important tricks for this recipe. I did find that the truffles were easier to dip after the cake batter balls had spent some time in the refrigerator. I also used a toothpick to dip. It makes things really easy, and just pull out the toothpick once the truffle shell has hardened. You can also use a fork, but I do think the toothpick method is much more simple! Take these super delicious truffles to your next party or celebration, or keep for yourself to indulge!! 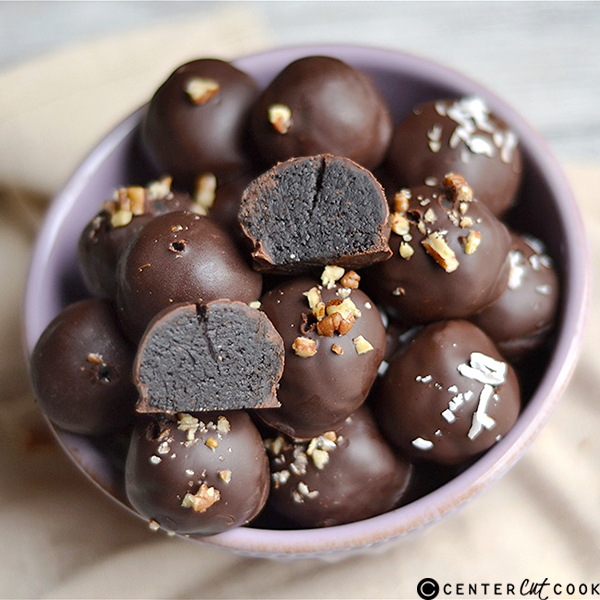 These truffles should be stored in the freezer or refrigerator. My personal choice is the freezer or else I eat waaaaay to many at a time! This recipe does make a lot of truffles, I was able to make 45 with this batch. Enjoy! In a medium sized bowl, whisk together cocoa powder, flour, and salt. Set aside. In a large mixing bowl, or using a kitchen mixer, beat together sugar, butter, and vanilla, until light and fluffy (approximately 3 minutes). Slowly add dry ingredients to wet a little at a time, and alternate with milk. Using a mixer, continue to mix until the dry ingredients are completely incorporated into a thick batter. Roll the batter into small balls that are 1 – 1.5 inches thick. Place the cake batter balls onto parchment paper. For best results, refrigerate for at least 30 minutes before dipping in chocolate. Prepare your chocolate shell: melt your semi-sweet chocolate and butter in a microwave safe bowl in 30 second intervals. Alternatively, heat on the stove over a double boiler. Place a toothpick through the top of the cake batter balls, and dip into the chocolate (you can also use a fork). Completely coat, and set on parchment paper to dry. Sprinkle any toppings on the truffles. Completely dry at room temperature for at least an hour before serving. You can also refrigerate for 30-40 minutes or freeze for approximately 20 minutes. Once dried, remove toothpicks and serve!